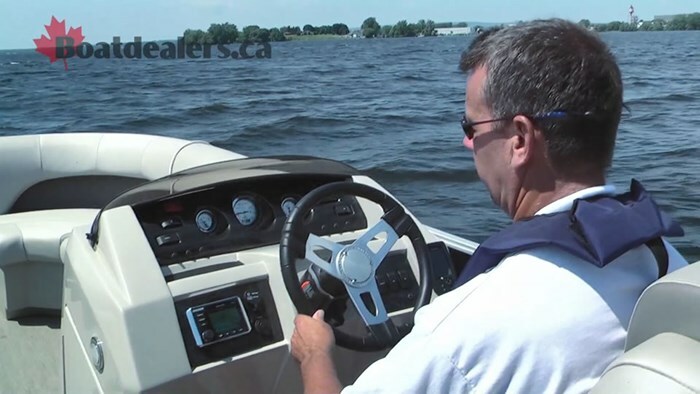 We arrived at the dock and all we could see of the boat was….well she was completely dressed in her mooring cover so all we could actually see was the super cool looking Evinrude G2 hanging on the back. These engines still set me back as their look is so different from everything else on the water. We unclipped the mooring cover, safely stowed it in one of the many under seat storage compartments and began our ‘work’. 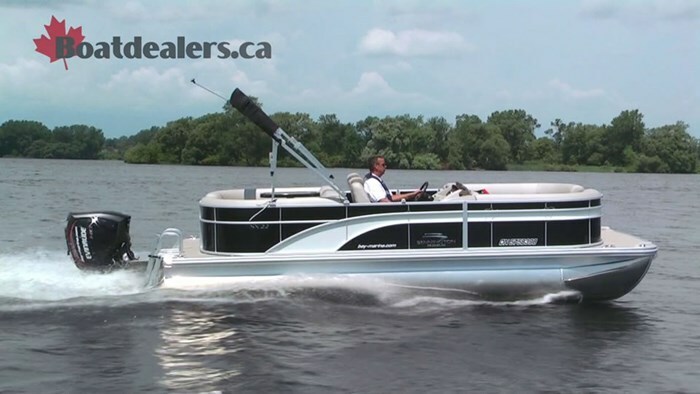 Bennington is undeniably the largest manufacturer of pontoon boats in the game. The founders of the brand began their journey in 1997 with a focus on building the best and that focus lead them over time to their current market position. Behind every Bennignton is a company prepared to stand up to their quality promise and they do so by following their passion in every step of the production process. Many brands use self tapping screws to mount flooring to their 1/8” thick cross channels; Bennington floors are thru bolted with nylon locking nuts and ¼” cross channels. The furniture on every model features self draining channels and five foam densities for unparalleled ergonomic comfort. And on top of their lifetime structural warranty, every Bennington is backed by an industry leading 10-year transferrable bow to stern warranty. The interior of this 22’ model is unbelievably spacious. 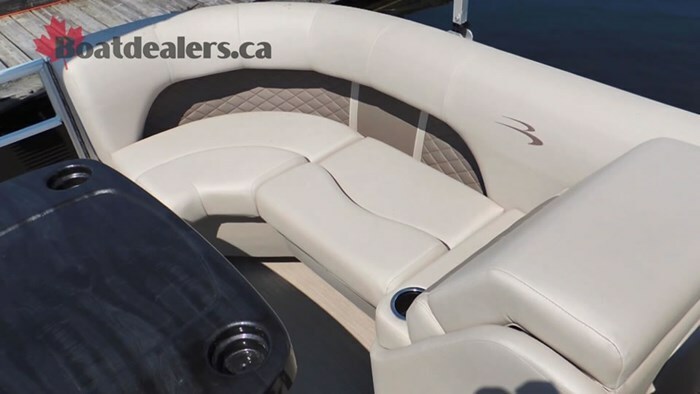 Our test boat featured Simtex vinyl which is soft to the touch and never seems to get hot on the skin. 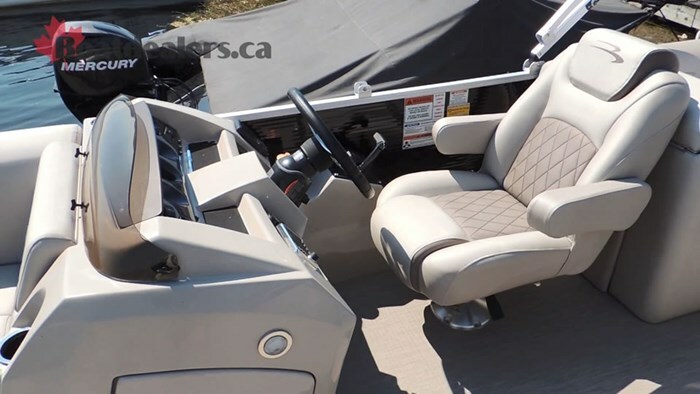 All the necessary creature comforts demanded by pontoon buyers are everywhere – plenty of storage, endless cup holders, deep step re-boarding ladder, a wicked Kicker sound system and ultra luxurious captain and co captain’s chairs. The over sized aft deck leaves plenty of room for tubers, skiers and just those coming in and out of the water to dry off while taking nothing away from the roomy interior. There’s a generously sized dinette table for afternoon snacks and if you’re taking an evening cruise the RGB lighting adds a feeling of comfort to the moment. 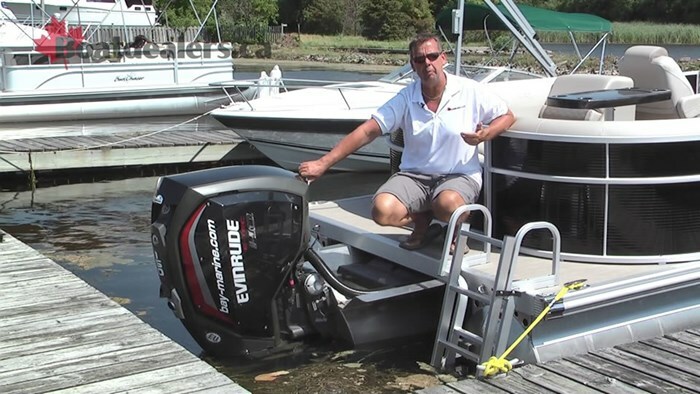 The Evinrude G2 is packed with a ton of features designed to simplify the boating experience while pairing perfectly with a pontoons character. 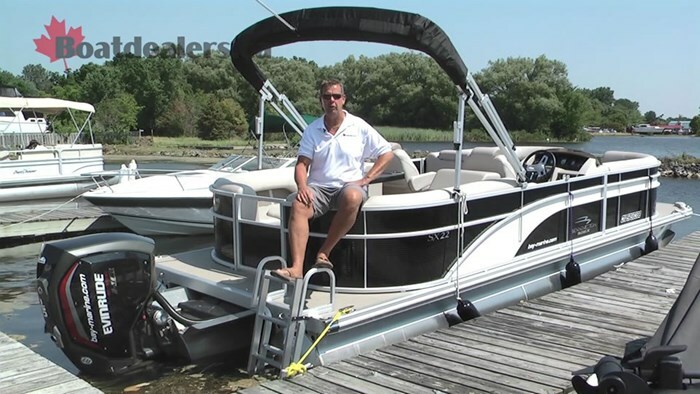 The dual axis rigging system makes for an incredibly clean appearance on the transom, the zero break in requirement means new owners can just take delivery and go drive their boat they way they want to and the auto winterize / auto store feature is great for taking advantage of late season boating opportunities. As we eased away from the dock and headed out to the 2’ chop Lake Ontario was greeting us with I wondered how she would perform. Bennington has 5 log design variations and the SPS (Sport Performance System) on our boat didn’t disappoint. 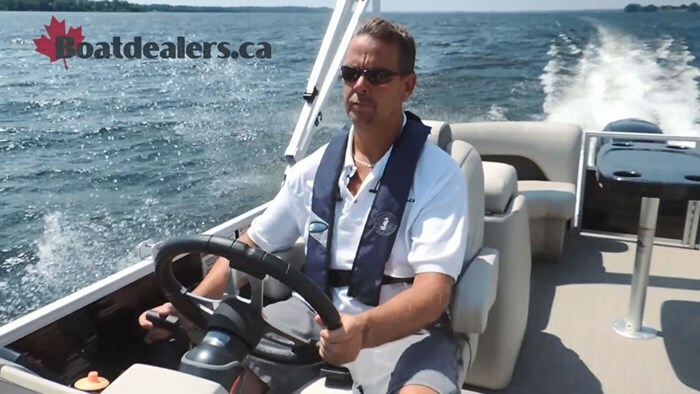 This package features 3 full length 25” tubes, lifting strakes on the centre log, performance foils on the inside of the two outer logs, an under deck wave shield to push the water away and Sea Star hydraulic steering. The pairing of boat and motor here is pure perfection. 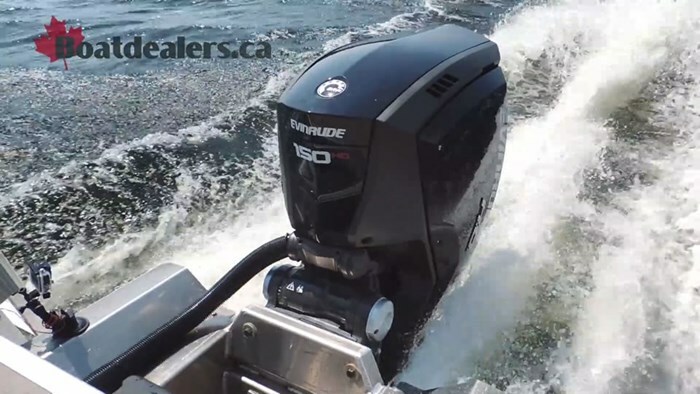 The Evinrude 150 gave us a 4.93 second time to plane and easily found 41 MPH at the top end. Cruising was comfortable at both 20 & 25 MPH with RPM’s in the 3200 to 3700 mark. The boat pushed thru chop and waves no matter how hard I turned or tried to find the ‘outer edge’. This package is clearly designed for people who truly want to get out on the water and experience the thrill of hearing kids laughing on tubes or toys, explore new coves or bays or just quietly take some friends on an evening cruise.